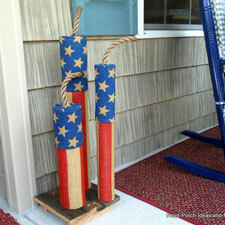 If you are planning a 4th of July celebration, then you will love what you see here. 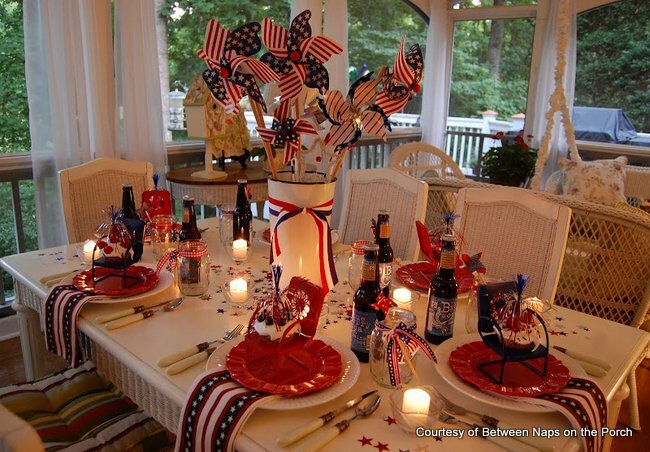 Susan, who is author of Between Naps on the Porch, is sharing her 4th of July decorating ideas with us. 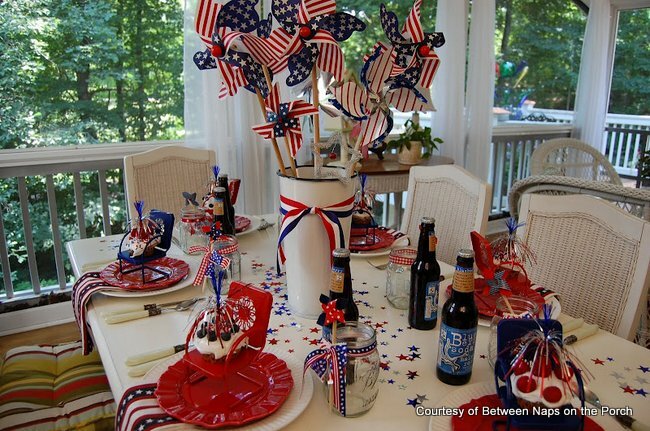 We are happy to share with you how Susan is decorating her table for this year's patriotic festivities. 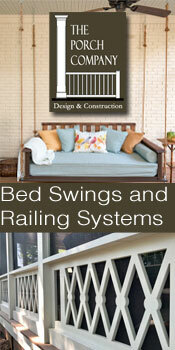 You will love her amazing screened porch - what a beautiful space to decorate. 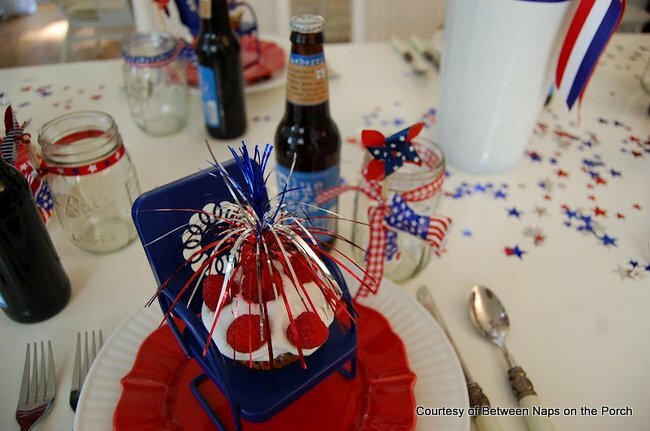 Susan says she had a lot of fun putting together this patriotic table setting of red, white and blue - and it surely shows. For her centerpiece (which Susan says is easy to make) she filled a tall container half full with kitty litter. 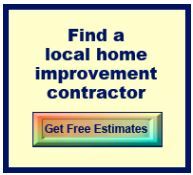 I bet you could use sand, marbles, beans or pebbles - if you don't have a kitty. Then came the fun part - she added colorful patriotic pinwheels in various sizes (and only three for a dollar) and a sparkly silver star. 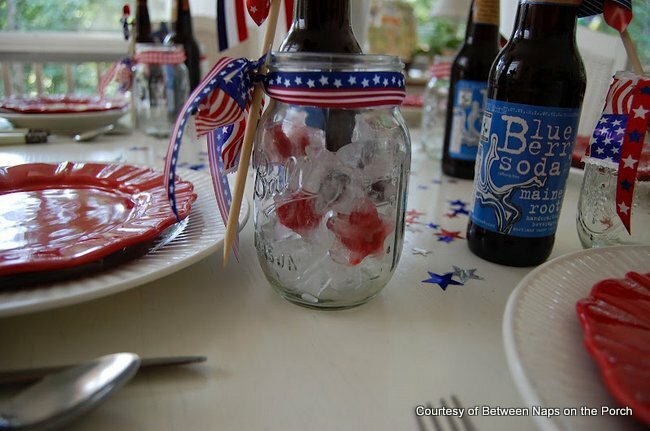 She tied the container with patriotic ribbon - grosgrain kind - to complete the centerpiece. What is so fun about pinwheels is that they spin when breezes blow across the porch. 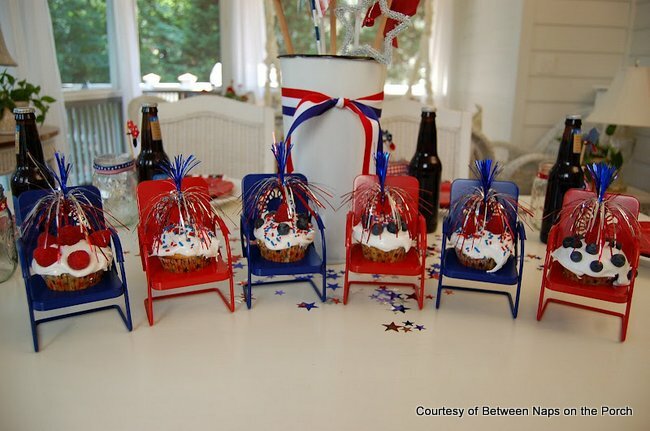 We like this idea - it's fun and makes for delightful 4th of July party ideas. Watch our video for some 4th of July celebration inspiration! 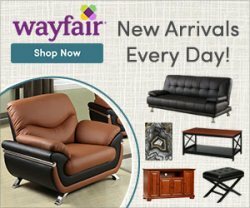 Do you see the red and blue lawn chair candle holders? They are intended for votives but Susan re-purposed them into cupcake holders. So fun and nice for conversation starters along with being colorful 4th of July decorations too! She frosted the cupcakes with 7-minute icing and then she topped the sweet little cakes with raspberries, blueberries, sprinkles and fireworks. Ummmmm good. Do you see Susan's elegant crystal stemware? They are Ball canning jars (yes!) and just right for this festive 4th of July celebration. Like the centerpiece, she tied the jars with patriotic gingham and grosgrain ribbons and added a small pinwheel to each. So what's to drink? It's blueberry soda with tiny star-shaped ice cubes. See them in the glasses? She used either a blueberry or raspberry in each. You just need a star-shaped ice cube tray. Susan mentioned that these fun ice cubes would look great in lemonade, too. A gorgeous view of Susan's table and her most inviting screened porch. This is our favorite picture of all. It's getting dark and the soft glow of candles is so beautiful. Susan is a big fan of using what you already have. For example, the "napkins" are actually hand towels she purchased a few years ago at Dollar Tree. You don't need to break the bank. 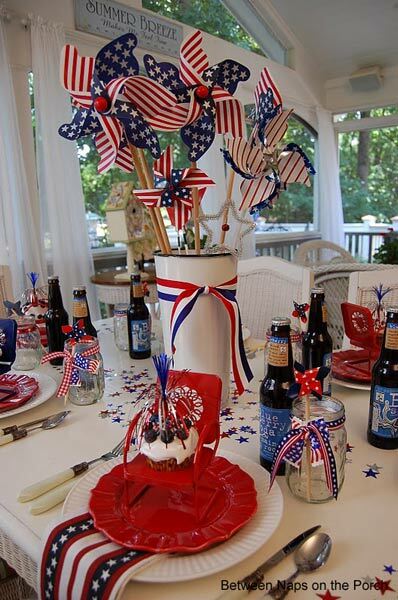 Susan's 4th of July table decorations are very memorable and delightful. 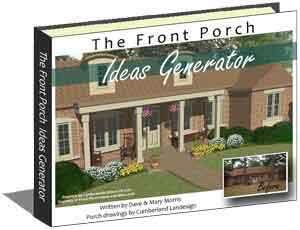 Can you imagine relaxing on her screened porch for a 4th of July celebration? It would be a delightful experience - guaranteed. In addition to Susan's fantastic patriotic porch, we wanted to give you one more idea for celebrating the 4th. Eileen, creator of The Seasonal Home, has a great idea. 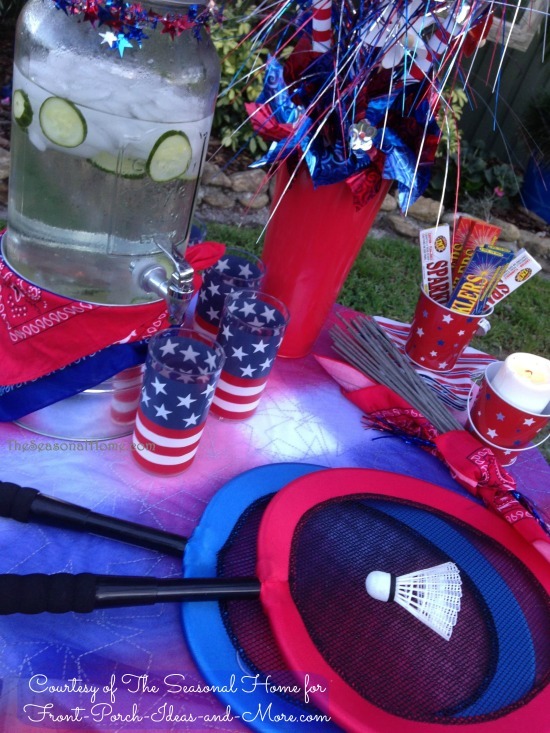 For your 4th of July party, setup a game table with all sorts of supplies for your guests. And include some cool water and cups for them, too. 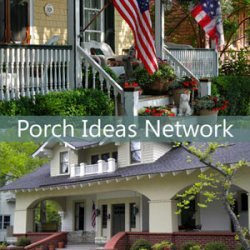 See more of Eileen's porch ideas right here. 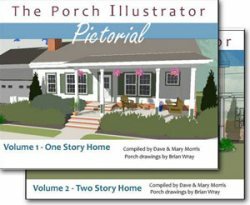 Susan is the author of Between Naps on the Porch. 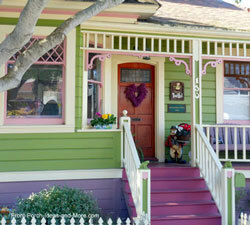 Susan's beautiful picture-intensive blog is all about her love of homes and gardens. She has quite a wonderful following of loyal subscribers. Take time this 4th of July to celebrate with loved ones and friends. 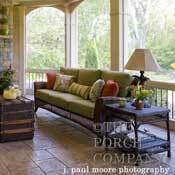 Your front porch, screened porch, patio or deck are perfect outdoor spaces for entertaining and visiting. 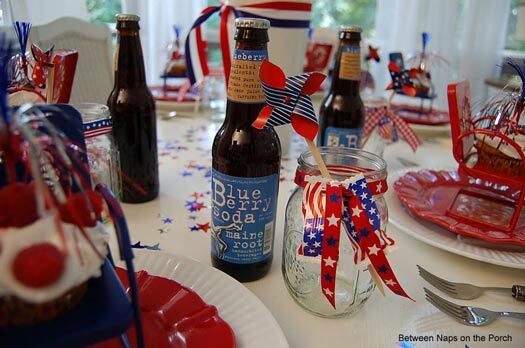 Visit a dollar store and pick up some festive red, white and blue trinkets to spice up your table. Your guests will be very impressed and you'll be so glad you did. Make your 4th of July celebration one to remember! 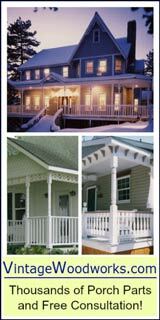 If you like screen porches as much as we do, you'll absolutely love these custom designs. 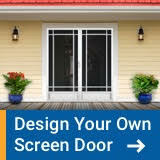 Get ideas for your own screened porch.